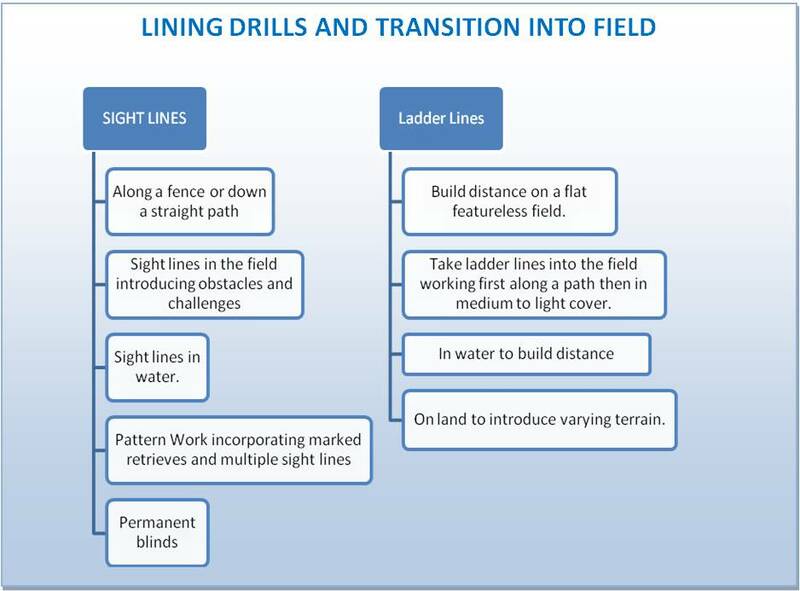 Everyone who has ever trained a gundog to work on blind/unseen retrieves has done this drill at one time or another. 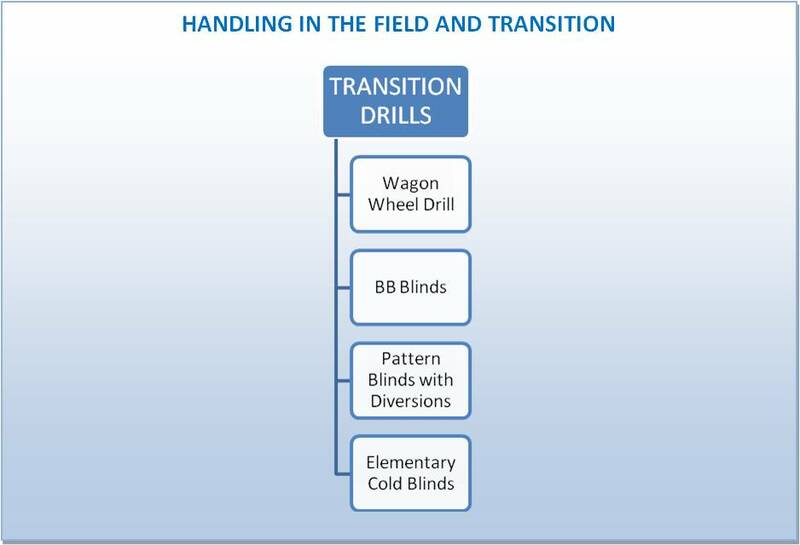 The “primary” role of the basic pile retrieve exercise is to teach confidence for the send away and part of the introduction to sight blinds. 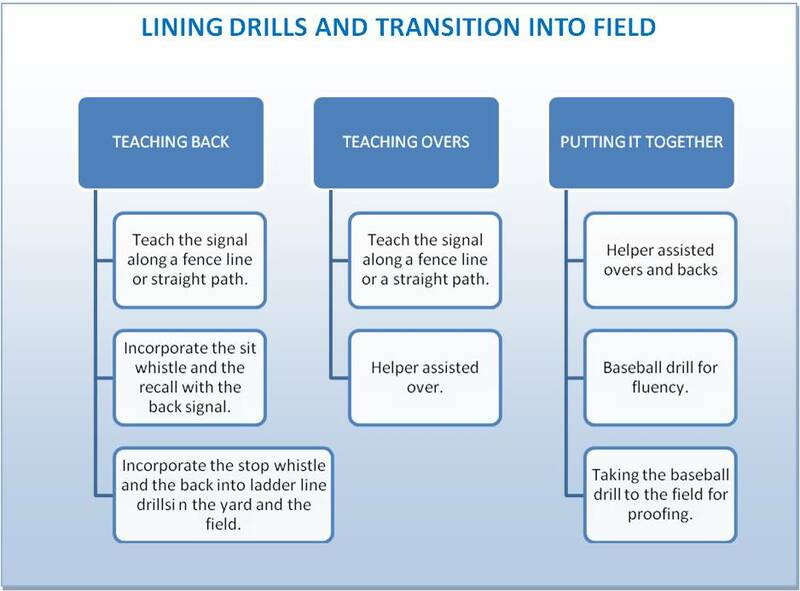 One of the principal aims is to teach the quick pick-up and prompt return. But, in addition, it also assists in the hold-heel-sit-deliver sequence becoming very automatic in the dog while he is concentrating on being sent for another retrieve. In the field the dog has to remember how to swing into heel position and sit down focussed on the field (not up at your face) while holding onto the one he’s carrying and then delivering it properly. He has to do all this while he is excited about watching the next throw, or going for the next bird of a multiple mark. Having a pile of objects in front of him that he knows he will be sent to again provide the forward focus and of course keeps the subsequent retrieve aspect in the mix while he practices all the sub skills. One disadvantage of pile work is that most dogs will try to shop, at least a little so the pile retrieve exercise can be considered a form of proofing to NOT do it. Shopping is likely to appear in a minor or major way with more than half the retrievers out there. Make sure that the recall component of the retrieve is much more fun than shopping. A solid, reliable recall is the best way to nip this behaviour in the bud from the very beginning. A dog cannot be spinning around to answer a recall cue if he is trying to shop. It is an incompatible behaviour. You could also limit options with a long line so that he cannot shop once something is in his mouth thus taking away the opportunity to self-reward with this undesirable behaviour. What would also work is following him to the pile so that you are close to him when he picks up which would make you the biggest thing in his world right then, not the next dummy. Then gradually lengthen the following distance. With a beginner dog that is only just learning the lining exercise you will probably get a couple of attempted shops and if you do not allow the shopping to become a habit by following the options outlined above the shopping will be over so quickly you will wonder if you really “trained” the dog not to do it. But you did. Dogs do what works. If shopping does not work for him the first time he tries it, compared to alternatives that work better (give him more pleasure), he is not likely to continue to do it. Another way to increase the no-shopping proofing once your dog has the basic understanding is to use a pile of non-similar objects. For example, large and small dummies, some canvas, some plastic, and a Dokken duck (if familiar to the dog). Do not expect the dog to grab the closest object, and it is okay for him to inspect the pile (quickly) for his preferred object. But whichever one he picks up first needs to stay in his mouth and be delivered, even if he wishes he’d grabbed a different one. He will get an opportunity to do that on the next send! From a judge’s point of view it is two-fold. The handler must be seen to have enough control over the dog to be able to direct him to an area in spite of any distractions on the way and then get him to establish a hunt in that area to come up with the bird. The dog must be seen to be responsive to the handler’s whistle and hand gestures, go out with style and enthusiasm, and use his nose to guide him to the fall once in the area. 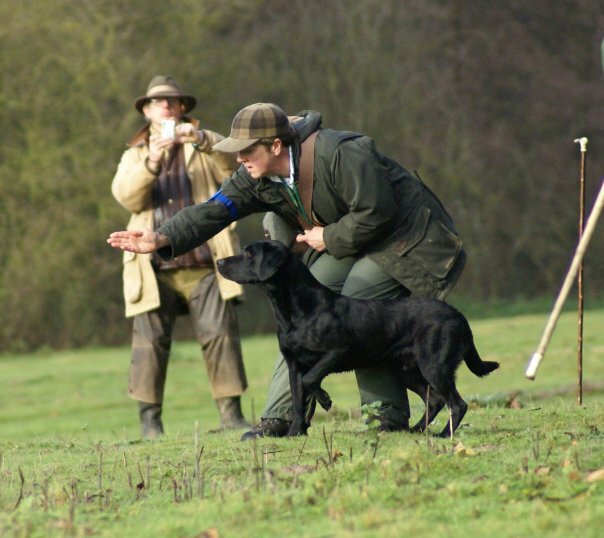 From a handler’s point of view it is the culmination of hours and hours spent on many repetitive lining and handling drills which started when the dog was a pup and will probably continue until the dog is in his 4th and 5th year. 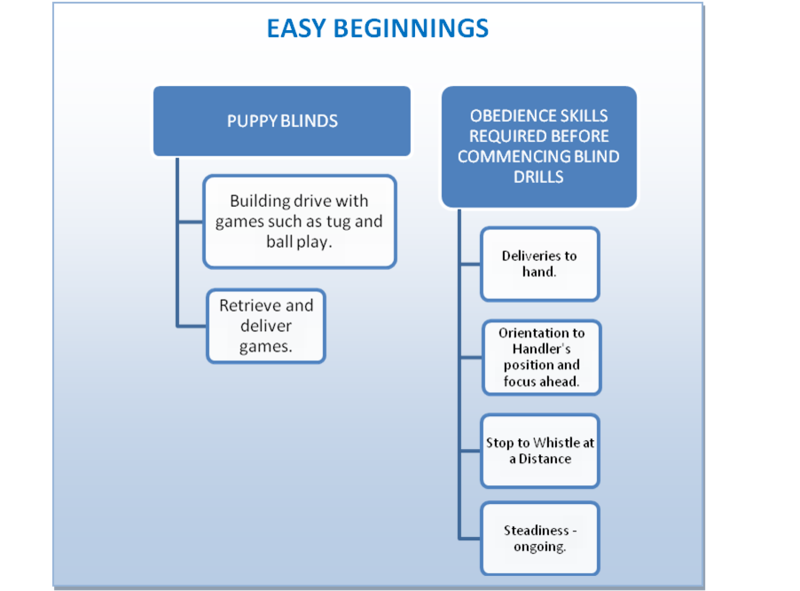 It is, in the case of the team that has done all the preparation and proofing necessary for the level of competition they find themselves in, the incredible feeling of total focus and communication between you and your dog that makes a successfully executed blind retrieve the ultimate and most satisfying game you can play with your dog. From the dog’s point of view it is knowing exactly what is required of him when the two of you walk into line for a blind. He will be watching from signals from you to indicate where he must look and in which direction to go. It is the only time when his natural ability to retrieve the bird take second place and he understands this. It is his confidence and trust that you will guide and direct him to where these natural abilities can take over in his final hunt for the bird. This attitude does not develop overnight but takes (dare I say it) years to build. In a young dog, confident in his ability to mark a fall, establish a hunt and find the bird without any help from you, this realisation has not yet penetrated and I know how frustrating it is to send a young dog out to a blind only to have him wildly hunt an area the size of a rugby field, totally ignoring any whistle commands or hand signals you might be making from the line. Take heart – the penny does eventually drop, and when it does all the seemingly mindless repetition of drills and exercises you have been doing in training all falls into place, and you have a good “blind” retriever.